As I sit home on a Saturday night, just a few days after the verdict in the Boston Marathon bombing trial, I am thinking about all that has happened over the last two years. You see, this coming Wednesday is 15 April. Besides being tax day, it also marks the two-year anniversary since two evil brothers exploded bombs at the finish line of the 2013 Boston Marathon. I have never shown these two losers the respect of mentioning their names, and I do not plan to change that here. 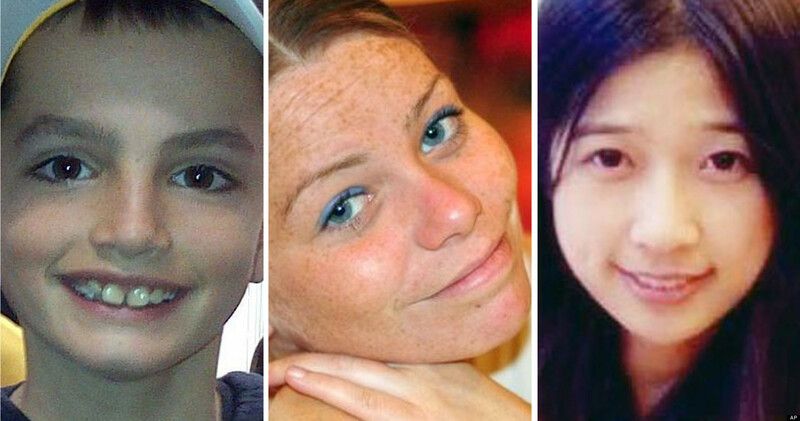 That beautiful afternoon on Boylston Street in Boston, the explosions killed three innocent people (29-year-old Krystle Campbell, 23-year-old Lingzi Lu and 8-year-old Martin Richard) and injured over 260 others. 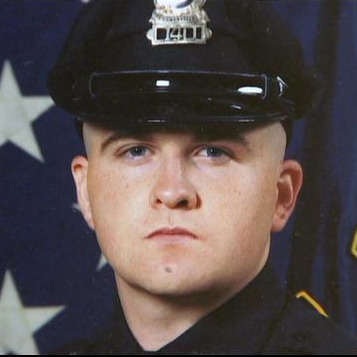 A few days later, they killed Sean Collier, a 27-year-old MIT police officer. During an extensive manhunt, one of the terrorists was killed and the other was eventually captured. It took two years, but the trial for the other terrorist concluded last week with guilty verdicts for all thirty counts. Seventeen of those counts could carry the death penalty when the penalty phase starts next week. Personally, I hope he gets the absolute maximum penalty possible. In fact, I want him to get the death penalty on all seventeen counts where it is a possibility. You may wonder why I feel so strongly about this. For those that do not know, I was running the race that day and wrote about it here. In fact, had I not had a minor leg issue around mile 22 or 23, I likely would have been at the finish line at the time of the explosions. Instead, the Boston police stopped us about a half mile from the finish. My friend Jack was also running the marathon that day and was just a little ways behind me. The biggest concern I had after learning about the explosions was that Jack’s wife, Barbara, was in the grandstands at the finish line. You can imagine my relief to find out that she was okay despite being right across the street from one of the bombs. As I heard about the verdict, my first reaction was one of satisfaction that justice might finally be served. Of course, I hope the penalty phase delivers an appropriate sentence for the heinous nature of the crimes. The more I thought about it, some of the emotions from that day returned. I found myself thinking a lot about Krystle, Lingzi, Martin and Sean. Three of these victims were just watching friends and family finish the most prestigious marathon in the world. It was supposed to be a time of celebration. Instead, a senseless act took them away from their friends and family in a horrific fashion. There were an estimated 264 other victims that day, all of whom found their lives forever changed. There were numerous stories like the one about Celeste Corcoran who lost both legs below the knees and her daughter Sydney that was also severely injured. Sisters Nicole Gross, who had her left leg broken and right ankle fractured, and Erika Brannock, whose leg had to be amputated, were at the finish to watch their mother, Carol Downing, complete the 26.2-mile course. Eleven-year-old Aaron Hern was there with his dad, Alan, and little sister, Abby, to cheer on his mom, Katherine, in her first Boston Marathon. He suffered significant injuries that landed him in the ICU. Newlyweds Patrick and Jessica Downes both lost their left leg below the knee and Jessica was in danger of losing her remaining foot. There are so many more stories like this. These are the people that should be remembered. These are the people I choose to honor, not the loser that was put on trial. You see, these people exemplify the power of the human spirit. These people show that the terrorists will not ultimately win. I also choose to remember the 2014 Boston Marathon. The feeling in the city the next year was much different. It felt like there was still a sense of mourning over what had happened the year before. At the same time, there was a muted excitement during the weekend. You could see the steely resolve of the runners as they walked around the expo. It was like we all knew the significance of what would happen on Monday. The anticipation brimming over by the time the race started. In a normal year, there would be around 27,000 runners lining up to start the marathon in Hopkinton spread out over three waves. Last year, there was such an interest in running the marathon that the Boston Athletic Association added a fourth wave which brought the number of runners up to 36,000. In 2013, I felt great throughout the race. The weekend was absolutely perfect. It started with a surprise 70th birthday party for my Dad before I left town on Saturday. On Sunday afternoon, I attended my first baseball game at Fenway Park. When Monday arrived, it brought an absolutely gorgeous day for a marathon. I knew I was ready. I had devised a race plan with my coach, Danny Haralson, to run my first sub-4:00 marathon. Danny always tells us to “plan your race and race your plan.” That is exactly what I did. For about 22 or 23 miles, I was right on plan and felt terrific. Suddenly, I got a strange pain in the quadricep muscle of my left leg. It was a pain I had never felt so I tried to run through it. Eventually, it started hurting bad enough that I finally had to walk a little bit. I was frustrated at that point. The walking was enough to keep me from hitting my goal. Somewhere past mile 25, I crested a small hill and found people in road stopping the runners. At first we did not know why but we soon found out about the happenings just ahead of our location. 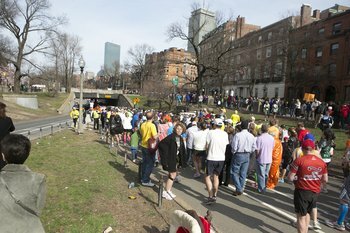 The thoughts of finishing the Boston Marathon changed to concern for those injured or killed. I struggled with accepting a medal for that race. To this day, it is still the only race that I have started but not crossed the finish line. Jack got my medal and put it around my neck at the airport the next day just before our flights left. After he and Barbara left me to board their plane, I put the medal in my backpack. I just could not wear it. It took me about two months before I would wear the race shirt. Every time I saw something that reminded me that race, I would find myself getting emotional. Even though it was challenging to find a way to deal with what happened, I also was determined to go back the next year if given the opportunity. I knew that was my way of showing the terrorists that they would not win. Location where the police stopped us somewhere past mile 25. 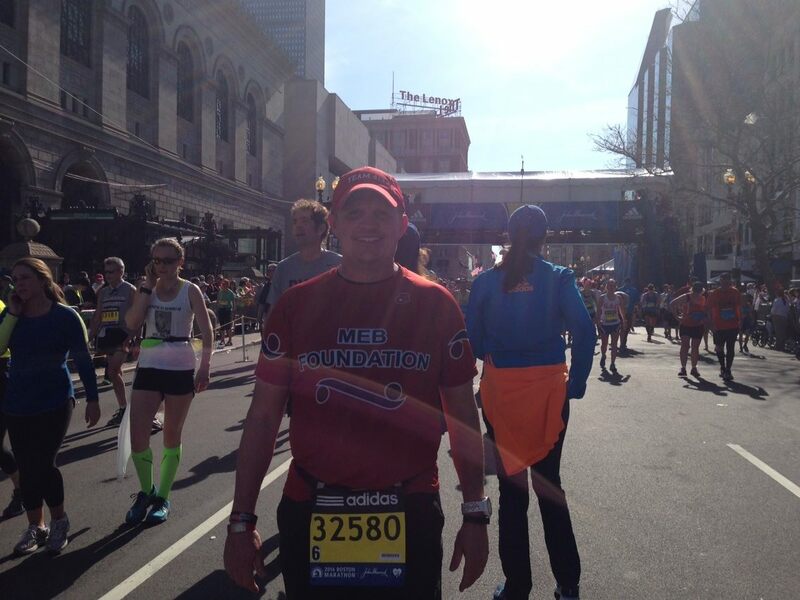 That’s me in the red MEB Foundation shirt in the bottom right corner. This is what the scene looked like where the police stopped within just a few minutes. Fortunately for me, the Boston Athletic Association decided to allow those of us that did not get the opportunity to finish the 2013 race to come back in 2014. There was a special registration period for the approximately 5,600 runners that fit the criteria. I registered within ten minutes of that registration period opening. I was determined to finish what I had started the year before as I wrote about here. As I mentioned earlier, the mood in Boston was reserved all weekend, especially around the expo. Jack and Barbara also went back and I was blessed to have my wife, Caroline, join me this time. Although the mood was reserved, there was a feeling of anticipation too. The night before the race, Jack, Barbara, Caroline and I had the pleasure of spending a few minutes with Meb Keflezighi and his wife, Yordanos. We talked about the significance of the 2014 marathon after what had happened in 2013. 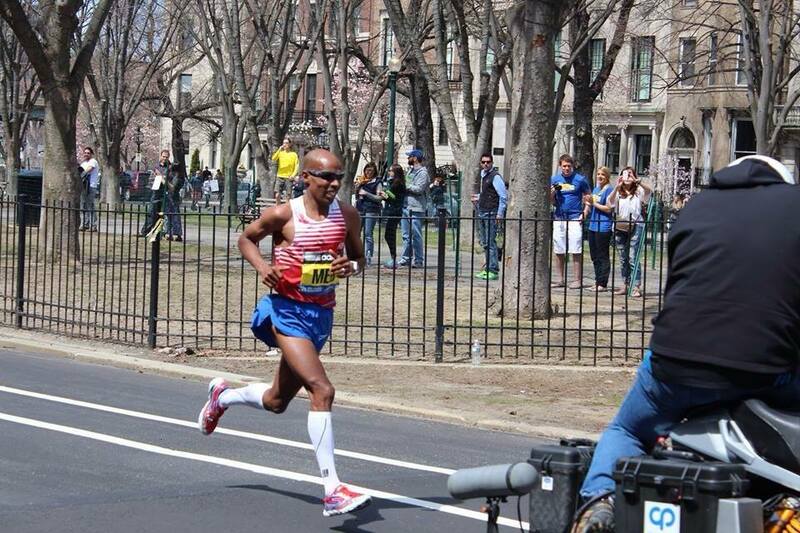 The next day, Meb ran the race of his life. He not only ran a PR with a time of 2:08:37, but he also became the first American to win Boston in 31 years. To show what the race meant to him, Meb wrote on his race bib the names of the four people killed the year before. Even though I did not run the way I had hoped, it meant a lot to learn while I was around mile 12 that Meb had won the race. When I finally made it to the place where I had been stopped the year before, I was determined to run from there to the finish line. The excitement, especially on Boylston Street, was the most amazing thing I have ever experienced. The muted excitement from the weekend was overflowing on that Patriot’s Day. It was like the people of Boston were reclaiming their streets. They were taking their race back. This was Meb running through the place where the police stopped us in 2013 on his way to winning the 2014 Boston Marathon. My picture just after completing the 2014 Boston Marathon with the finish line in the background. I asked a volunteer to take this picture since I did not get to reach this point the year before. 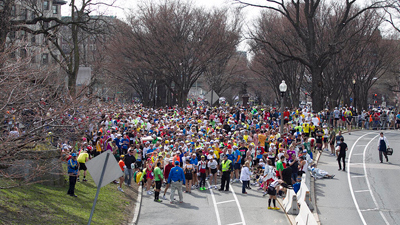 The 2015 Boston Marathon is only a couple of weeks away. There is a side of me that wishes I could be there again this year. Although I will not be running the marathon this year, I will be following it closely. I would like nothing more than to see Meb win again this year. With the verdict, and hopefully sentencing, out of the way, the world can place their attention back on the race and not give these terrorist the time of day. They do not deserve it. Instead, let us honor those that have shown the resolve that is the American spirit to overcome the tragic events of two years ago.